The secret to putting warm comfort food on the dinner table night after night, year after year is cookware you can depend on. You might not be able to put your finger on the reason you reach for that same pan every night, but we have some ideas. You’re probably not thinking about the flared rim of the pan when you pour away grease from your ground beef without a spill. Or, you might love the satisfying heft of a pan, but that weight is actually reinforced titanium in the pan that helps it keep its shape and distributes heat evenly. 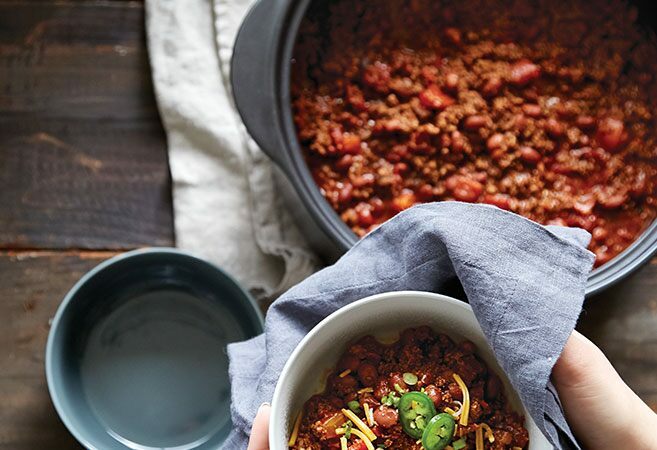 If all of these little details go unnoticed as you serve up a rich, meaty dish of chili on a busy Tuesday evening, then we’ve done our jobs right! 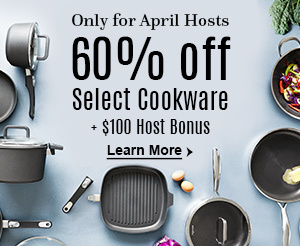 Pampered Chef offers durable, quality cooking tools and stands behind them with multi-year and lifetime guarantees. 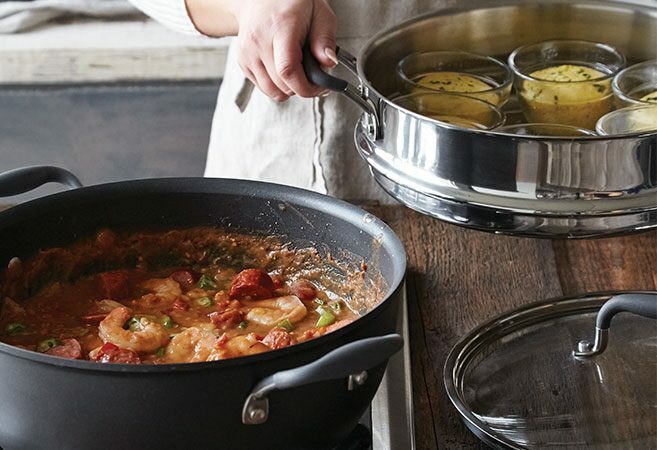 Discover what sets our essential cookware and kitchen tools apart and why they’re better than the average pots and pans. What it is: The All-Purpose Pot has a unique, modern shape and thick bottom that browns large cuts of meat and evenly distributes heat throughout your favorite soups and stews. Why you’ll love it: It’s ideal for making large batches of food. Cook once, eat twice meals are huge timesavers during the week. We stand behind it: Lifetime guarantee. This covers material defects and workmanship, but not misuse or ordinary wear and tear. Comfort food recommendation: Creole Gumbo with Cornbread Muffins. Pair this pot with the 12″ (30 cm) Steamer to steam the cornbread over the bubbling gumbo. The entire meal is made at once. What it is: The Deep Covered Baker is made of stoneware. This material draws moisture away from food and distributes heat evenly on all sides. Why you’ll love it: Expect crispier, even browning on breads and pastries. You’ll enjoy juicier meat (even meat cooked in the microwave!). And, with its elegant, trendy graystone glaze, you can bring casseroles, cakes, roasts, and hearty stews directly from the oven or microwave to the dinner table. We stand behind it: All our Stoneware is made in the USA. And, the Deep Covered Baker comes with a 3-year guarantee. Comfort food recommendation: Mexican Quinoa Bowl. 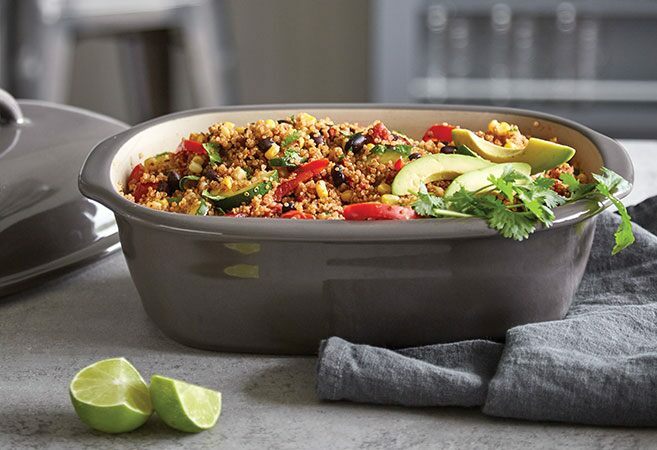 It combines earthy, gluten-free quinoa with black bean, cilantro, and lime flavors. Why Choose Stainless Steel Pans? What it is: The 12″ (30 cm) Covered Skillet has an aluminum core, one of the best heat conductors, sandwiched between stainless steel throughout for faster, more even heat from the base to its side. Why you’ll love it: Stainless cookware gives you the best possible results no matter what you’re cooking. It’s excellent for browning meat and developing fond (the browned, caramelized bits stuck to the bottom of the pan after cooking). Add liquid to release the fond and give great flavor to your recipe. We stand behind it: Lifetime guarantee. Comfort food recommendation: Italian Pot Pie. It’s a family-favorite one-dish meal. The recipe comes together on the stove. It’s topped with cheese and pizza dough, then finished in the oven. What it is: The Rockcrok® Dutch Oven is created from a clay with exceptionally high heat resistance. Extra-long heat retention means food stays hot in the pan until everyone’s finished their second helpings. Why you’ll love it: Cook every step of your dish in the same pan to quickly develop rich, blended flavors. 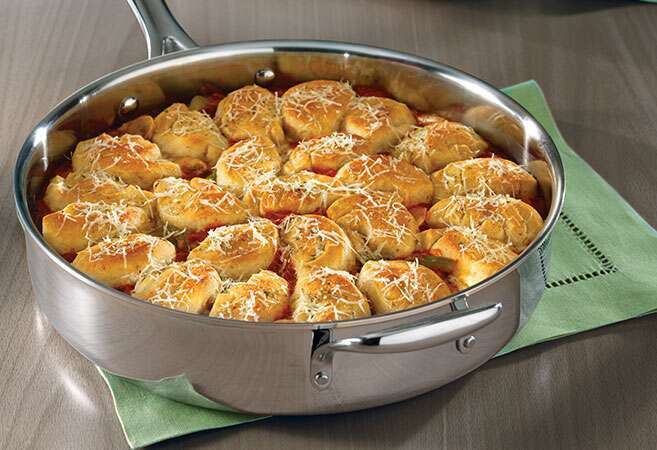 Use your Rockcrok® as a saucepan, skillet, casserole dish, Dutch oven, stockpot, and cake pan. When dinner’s over, it goes in the dishwasher! We stand behind it: 5-Year guarantee. 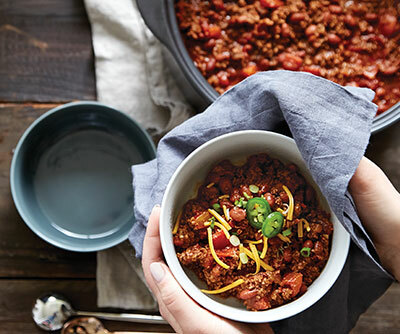 Comfort food recommendation: Easy Weeknight Chili. Cooking for a crowd? Double the recipe in the Rockcrok® Dutch Oven XL.